LOLCats are often considered to be the archetypal Internet meme, a piece of often entertaining cultural currency that spreads rapidly through social networks and media platforms. However, unlike most Internet memes whose potency tends to wane after a short period of time, LOLCats have remained relevant and popular for the better half of a decade, inspiring a devoted following. 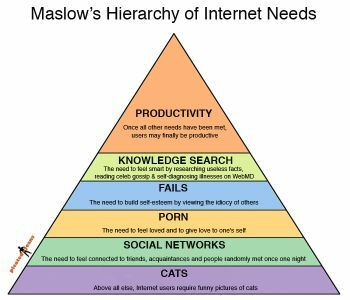 This necessity of cats to the Internet has been recognised in cartoons, such as Maslow's Hierarchy of Internet Needs, but now seems poised to break out of the box. At the end of August, Minneapolis in the USA will play host to the first Internet Cat Video Film Festival. The phenomenon, once constrained to YouTube, is about to about to extend its claws into the real world. Even computers are not able to deny the appeal (or sheer dominance) that cats have over the Internet. When Google joined 16?000 processors together to try and simulate a human brain they released it onto the Internet and sat back to let it learn. After sampling around 10 million images taken randomly from YouTube, what had Google's virtual brain found out? It learned, completely unguided, to recognise cats! With cats, particularly LOLCats, dominating the internet world and proving so popular it's surprising that Big Cats only ranked as the fifth most popular fursona species according to the International Online Furry Survey: Winter 2011. Cats in general – the kind better represented by LOLCats – came eighth, accounting for just over 4% of fursonas.